Poor Simon didn’t stand a chance today when Huang told us we were going to Ha Long and our first stop was a pearl factory. Pearls are my favourite, and whilst Simon has already bought me a string of them and a bracelet to match, you can’t have too many – right. It was about a one and a half hour drive to Ha Long and when we arrived at the factory we were given a intro into pearl purchasing, including how to spot a fake. Then a bit of retail therapy, a single tear drop pearl, freshwater.I could have gone crazy, especially with inspirational pictures of Diana, the Queen, Michelle Obama and Julia Gillard on the walls all donning pearls. I do like the way the shops try to cater to western tourists, but get it just a little bit wrong. After a seafood lunch, we then road the bikes 30kms around Tuan Chau Island, which is just of the coast but joined by a bridge. The riding was much better today as the temperature had dropped and the humidity was replaced by a soft breeze and the odd spot of rain. 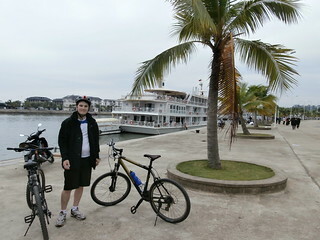 We finished the ride with some green tea at Ha Long port, before heading back to the hotel for a rest. “When in Vietnam you eat what the Viets do” to misquote St Ambrose Simone. We ate Guinea Pig, a large rodent, in Ecuador so surely a entree of mouse would have been a culinary experience to share with us all and the movie of the experience, starring Gemma, a worldwide hit on youtube. Please don’t tell me you didn’t buy pearls? Just one. A necklace with a freshwater pearl. I am saving my shopping outbreak for Nha Trang and Ho Chi Min. I need to ditch some clothes to make room in my pack and can’t quite do that yet whilst still cycling. Please to hear Simon open his wallet finally. I don’t think that one necklace of freshwater pearl is not enough you need earrings to go with that, Simon can carry more he done the training and does not need all his cloths: make room mate. I told her if she skips dinner she can have a pearl. Previous Previous post: What's for dinner?